• Is there a way to make a list of all of the people, and only them, who are buried in a certain cemetery (or any individual that is associated with a certain burial address)? 1. 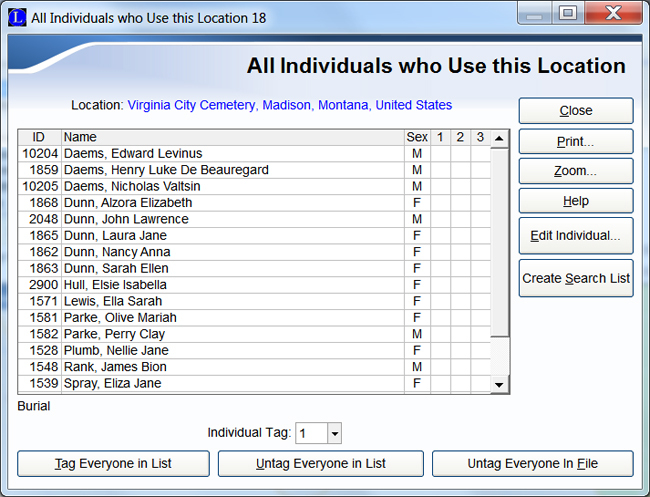 Click the plus ( + ) button to the right of the Burial Location field. 2. Next click on Burial Address on the popup menu. 3. The Event Address window will then open. But realistically, not everyone follows Geoff's advice. Some Legacy users prefer to enter the cemetery name right into the Burial Location as shown below, which adds this place to the Master Location List. 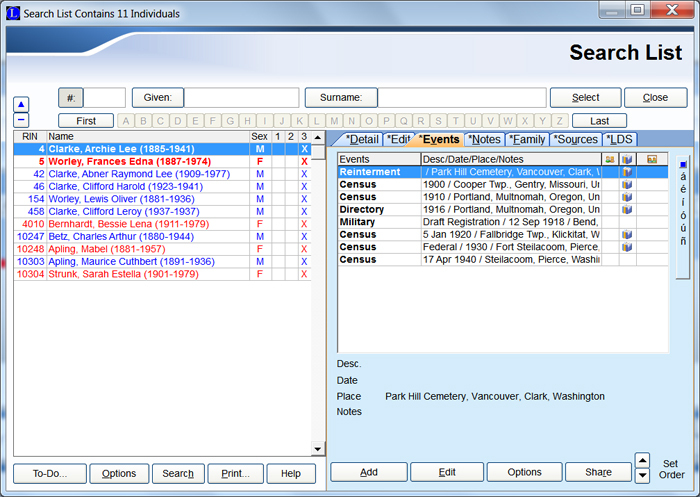 In addition, some users add the cemetery and related events as Events/Facts. These may in include things like a reinterment to different cemetery as shown below. First, open the Individual Information for a person buried at the cemetery of interest. 2. 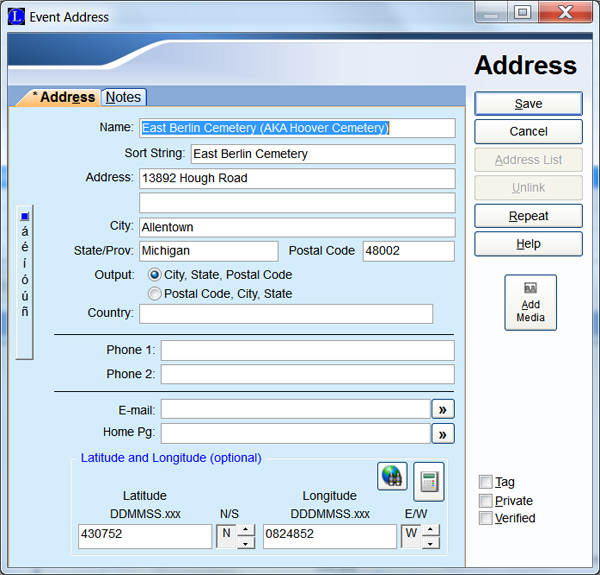 Click on Burial Address on the popup menu to open the Address window. 3. Click the Address List button to open the Master Event Address List. 4. 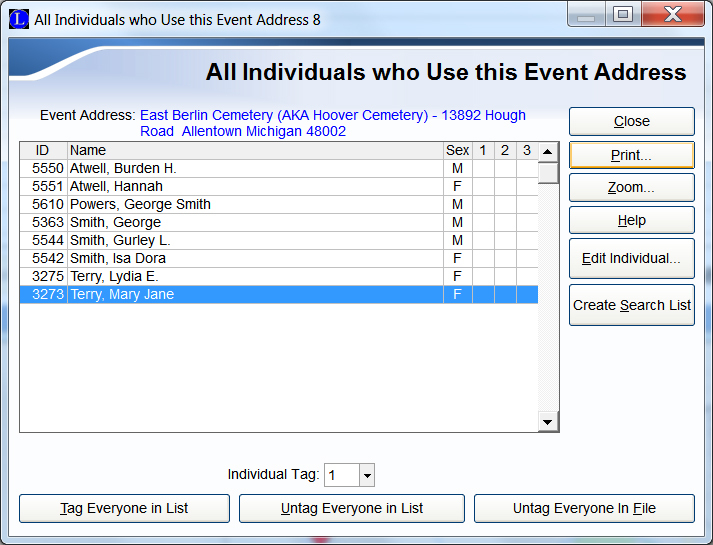 With the cemetery address line highlighted, click the Show List button to open the list of all individuals who use this cemetery address. 5. Click the Print button to make a hard copy. 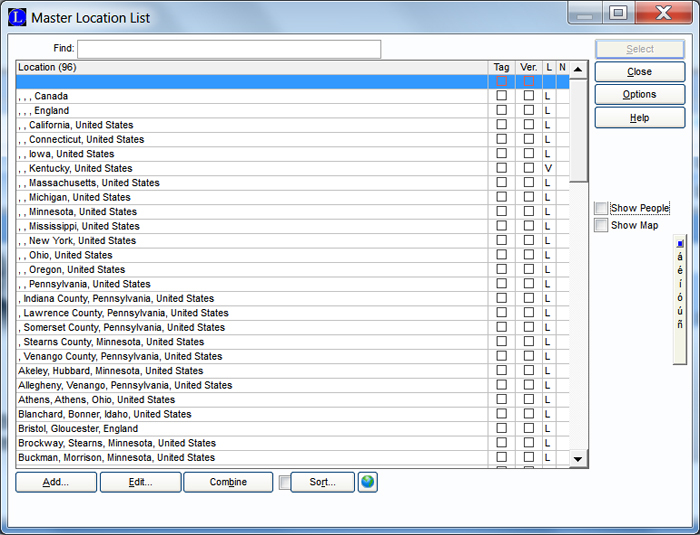 Or from the Individual's Information screen click the blue down arrow to the right of a location. 2. The Master Location List will then open. 3. With the cemetery location line highlighted, click on Options > Show List... to open the list of all individuals who use this cemetery location. 4. Click the Print button to make a hard copy. 1. 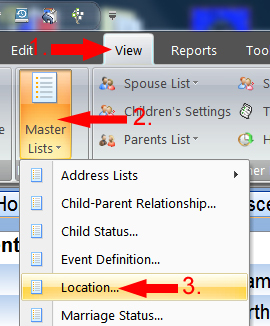 Click Search on the menu bar and select Find to open the Search window. 3. Select Clear List before this search and then click Create List. The Search List (a subset of the Name List) will then open. What is interesting about this Detailed Search is that two kinds of Events are included 10 Burial Events and 1 Reinterment Event (the highlighted item at the top of the list). 4. See Searching - Detailed Searches for additional information about Detailed Searches and printing the Search List..